12AT7 (2), 12AU7 (2), 6146 (2). 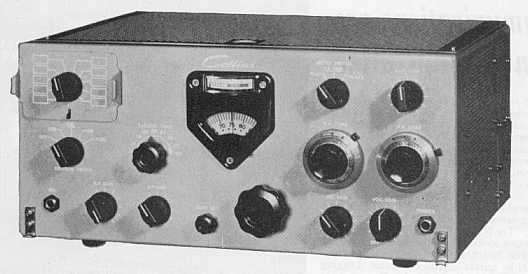 The Collins KWM-1 is the first amateur band transceiver designed for mobile and fixed station applications. Final amplifier plate input power is 175 watts PEP on SSB or 160 watts on CW. A crystal plug-in unit allows for the selection of ten crystal positions, each covering a 100 kc segment in the frequency range of 14 to 30 Mc. The Pi-L output network with roller-inductor provides for efficient and continuous tuning throughout the entire frequency range of operation. The transceiver utilizes VOX circuits for voice and modified break-in CW operation. Most of the tuned circuits and several tubes function in the dual role of transmitting and receiving. A front panel meter functions as the receiver's S-meter as well as an indicator for transmitter output tuning. Easily accessible controls on the front panel of the KWM-1 include the EMISSION SWITCH, EXCITER TUNE, ZERO SET, PA TUNE, PA LOAD, MIC GAIN, VOX GAIN, ANTI-TRIP, Band Switch (crystal selector), AF GAIN, RF GAIN, METER SWITCH, Main Tuning (PTO), DIAL Dimmer Control (after first models). Any 100 kc range from 14 to 30 Mc using the appropriate crystal. SSB (either sideband selectable), CW. Power can be delivered by an external supply such as the 516F-1 or 516E-1 which must furnish 800 vdc at 200 ma; 265 v dc at 210 ma; 6.3 v at 11 amps, and from -50 to -80 vdc at 3 ma. Heater supply may also be 12.6 v at 5.5 amps. Reduced final plate voltage and current typical of mobile installations will reduce power output specifications. 90 watts PEP (14 - 25 Mc); 80 watts PEP (25 - 30 Mc). Carrier suppression -50 db; unwanted sideband -50 db; oscillator feed-through and/or mixer products -50 db. Second harmonic -40 db. Third order distortion -30 db. Within 100 cps during any one-hour period following 20 minute warm-up. I kc after midband calibration. 52 ohms nominal, Pi-L network is capable of matching up to 2.5:1 VSWR. Keying is free of chirps and clicks. Break-in CW and side tone provided. 300 - 3000 cps nominal, determined by Mechanical Filter. Self-adjusting, dual time constant ALC increases the average talk power. RF feedback around PA and driver is provided for improved linearity. 1.0 uv for 6 db signal-to-noise ratio at 3 kc bandwidth. 3.0 kc nominal bandwidth at 6 db down as determined by Mechanical Filter. 14" W, 6 1/4" H, 10" D.